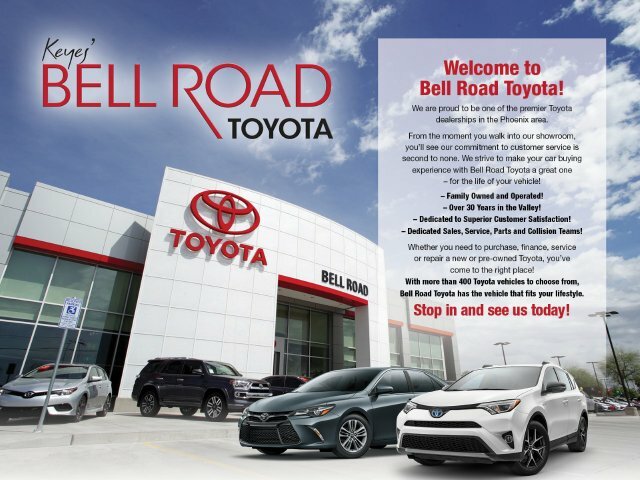 Why Service with Bell Road Toyota? Why Buy at Bell Road Toyota? Customer Cash rebates cannot be combined with any special APR programs. See dealer for details. Prices do not include tax, title, license, doc fee of $479, plus any items added to the original MSRP of the vehicle. Prices shown are for in stock units only. Dealer is not responsible for and typographical errors. Contact dealer for most current information. MotorWebs, Inc. and Dealership makes no representations, expressed or implied, to any actual or prospective purchaser or owner of this vehicle as to the existence, ownership, accuracy, description or condition of this vehicle's listed equipment, accessories, price or any warranties. Any and all differences must be addressed prior to the sale of this vehicle. Find a great sale price on the 2019 Toyota RAV4 LE FWD at Bell Road Toyota. The 2019 Toyota RAV4 is located at our Toyota dealership in Phoenix. So if you're looking for a great price on the 2019 Toyota RAV4 LE FWD or just looking to get an auto loan for the vehicle you want... you've come to the right place! Bell Road Toyota.